Why don't you take a break, whip your hair, and bob your head sensational sound of one of today's most exciting boy bands?! Hot off the heels of their recently concluded 'Invitation' tour, the four-piece boy band Why Don't We have packed their bags once again to go across many cities and states for yet another tour leg in support of their debut album "8 Letters". 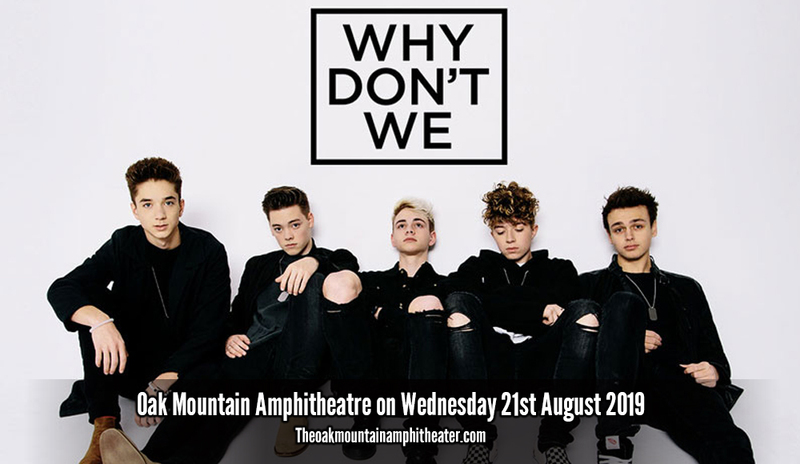 And just around the neck of the woods, Why Don't We is slated to take center stage at the Oak Mountain Amphitheatre on Wednesday 21st August 2019. Fangirls and fanboys are definitely not taking this piece of news sitting down. They're all gung-ho on getting first dibs on those hot tickets. Why don't you start shouting out to your tribe and book your tickets now?! Catch 'em while you can! Jonah Marais, Corbyn Besson, Daniel Seavey, Jack Avery, and Zach Herron were all YouTube stars in their own right. Individually, they each had a significant following in their own respective channels. Hence, they always graced social media tours and gatherings. They all met via the DigiTour event, and decided to join forces. Strike while the iron is hot. The boys called themselves 'Why Don't We', and within a month after they became a band, they released their first single, "Taking You." Their first EP was released a month later, and they began touring in December 2016. Why Don't We has the uncanny ability to release one single and EP after another, then charged with the zeal and enthusiasm to go on tour shortly thereafter. Some of their chart-toppers include singles such as "Something Different" , "Invitation", and a song featured on a track by Logan Paul called "Help Me Help You." For their new EP, the song “Trust Fund Baby,” they were entrusted by superstar singer-songwriter to interpret, record, and include this in their current EP. Why Don't We is one of today's most spectacular stars on the rise. Hitch your wagon to these stars and delight in their heavenly voices and awe-inspiring showmanship. Catch 'em while you can!